You will no longer be able to sign in to feedburner.com, but that’s okay: from now on, there is no reason to do so. Also, your old FeedBurner feeds, found at feeds.feedburner.com, will automatically redirect traffic to their new addresses on the feeds2.feedburner.com domain. You may still want to update any links or buttons on your website to use the new feeds2.feedburner.com address. I got this message in my inbox after I initiated my feeds transfer from Feedburner account. 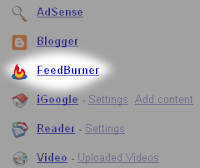 Google had already acquired Feedburner long time ago on 1st June ’07 , as announced on Feedburner blog. Now Google is moving all Feedburner feeds to its own server and by the end of Feb’09 if you do not manually initiate the feed transfer from your existing Feedburner account then you would be contacted by a Google guy (not Matt) who would request you to do so. There will be a slight change in the feed URL but this is nothing to worry about as your previous feed will be automatically redirected to your new feed. After you have successfully completed the feed transfer you would receive a confirmation email message similar to the one that I got. You can then login to your new Google Feedburner account from Google.com>My Account where you will notice a new addtion to Google products. So go ahead and transfer your Feedburner feeds to Google ! Yeah I have already given it a try and frankly I see a sharp decline in the no. of feed readers. 🙁 Never the less I see these results to be more accurate than before. I am not sure yet how to transfer my feed because it says that my feeds are in use and some how I can not transfer them, do anyone have any idea what that means?